Joyful Socks Mom: Choosing Family Reading That R.O.C.K.s! Not just any book will do for the entire family. A book has to have balance. Families should only choose literature selections that R.O.C.K.! REAL - This means choosing living books. Charlotte Mason was the originator of the phrase living book. Home Hearts defines a living book as a book selection that ". . . is usually written by an author who is very knowledgeable about his subject, many times in an experiential way. The author tends to write from a love of his subject, one that propels him to write with an enthusiasm that excites the imagination of the reader and carries him along as though experiencing the subject first-hand." Choosing books from authors that are both knowledgeable and passionate about their subject is imperative. Enthusiasm is a great educator! OBSERVATIONS - The books chosen should bring a clear observation about life and people. CHARACTER - Choosing books that help to build good character and help a child attain real-world applications, are essential to home education. KNOWLEDGE - The reading of a good book should teach a lesson or moral, and not just entertain. Here are 25 Family Read Aloud Books that R.O.C.K.! 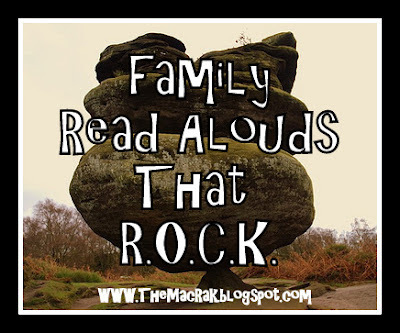 Do you have any tried and true family read aloud books that R.O.C.K. too? Be sure to leave a comment below on what books R.O.C.K. in your house!